Customs agents at the Cincinnati/Northern Kentucky International Airport were recently baffled by a tombstone that someone tried to ship via air from overseas. 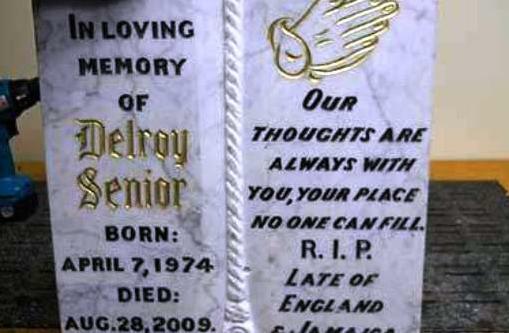 Apparently, it's just something that is never done - the costs to ship a giant heavy slab of stone via air are immense, and why would anyone do that when gravestones are almost always made to order in the vicinity of the cemetery in which it's to be used? 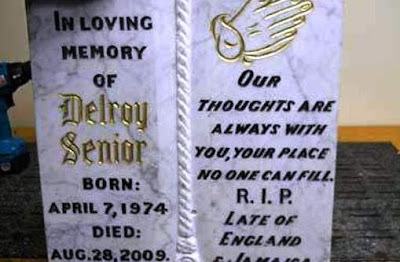 Upon further inspection, the agents started noticing other oddities - there was no last name on the headstone, assuming the senior in "Delroy Senior" is a suffix and not a surname. Being "late of England and Jamaica" was also puzzling to them, although I'll grant slack that someone could have genuinely considered themselves to have been of both places. But once they inspected it closely, they found the stone was actually ordinary cheap poured concrete painted with a faux-finish to look like granite. The drug-sniffing dogs were called in and they immediately went off like a geiger counter at the BP disaster site. As it turns out, the fake tombstone was hollow inside and filled with 50 pounds of marijuana. Bell said efforts to find the stone’s sender – or the intended recipient – have failed because everyone involved used fake names and addresses. “Everything came up as a dead end,” Bell said.